This is a very pretty Czechoslovakian Art Deco set comprising 2 scent bottles and a powder bowl. Each piece is in peach/pink glass and each base has 14 facetted sides leading to a 3 tiered top or lid in the case of the powder bowl. 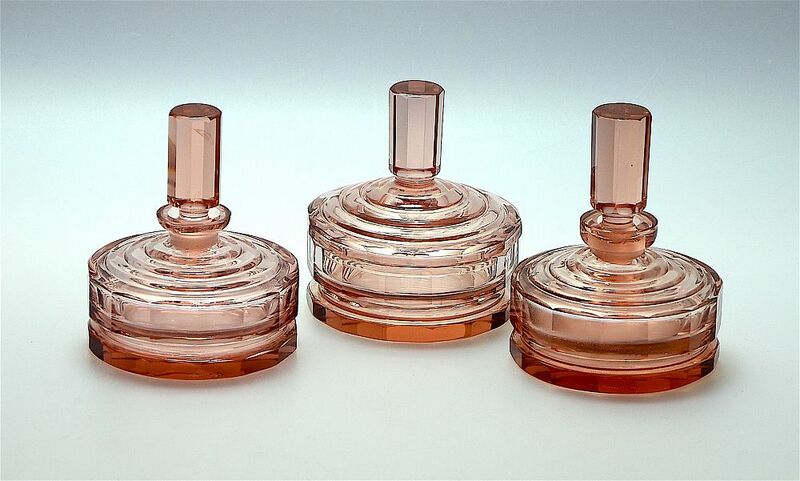 Each scent bottle has a cylindrical stopper with 10 facetted sides as is the finial on the lid of the powder bowl. The underside of each base has a circular stamp that is indistinct except for the word "Czechoslovakia". Very good but the stoppers of both scent bottles have a small chip on the base and one of the stopper has a flaw within the glass that has the appearance of a "gletz"